Each year, the last day of March is recognised as the International Transgender Day Of Visibility,TDOV. 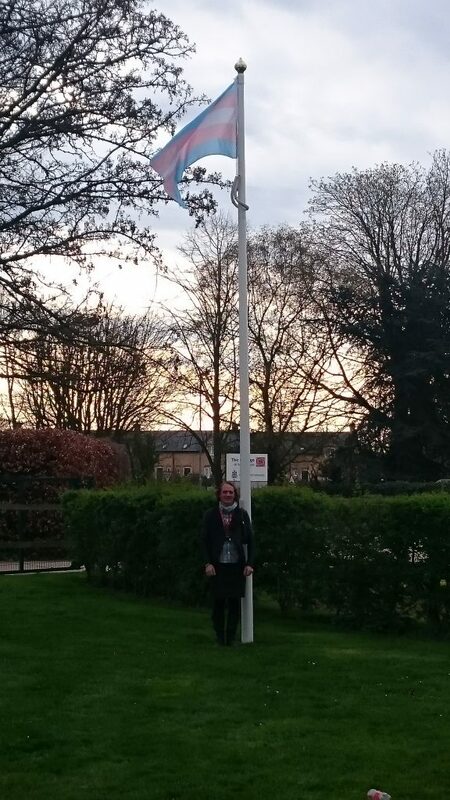 This year, our UNISON Steward Jude Hope, flew the Transgender flag at the Cambridge Campus of the College of West Anglia. Jude said, ‘The marking of this day is intended to raise further awareness of the continuing discrimination of individuals that identify as being transgender’. ‘It also acts to celebrate changes that have been made so far acknowledgement of the struggles experienced by so many in a continuing effort in trying to reduce and eradicate discriminations so that transgender individuals are more freely accepted as a welcomed and included person within society’. With Jude’s support, UNISON hopes that recognising TDOV, by raising the Transgender flag, will also be an event at Shire Hall next year, similar to the marking of LGBT month in February. Anyone who would like to support this campaign, or start an LGBT Group in the UNISON Branch, please contact the Branch by the usual methods. To find out more about TDOV search the hashtag #tdov or #transresistance on social media.